Performed with great nobility and considerable eloquence (...). Superbly done. Ondine's successful Paul Hindemith (1895-1963) recordings with the NDR Sinfonieorchester conducted by Christoph Eschenbach continue with another release featuring two major symphonic works by the composer: Symphonie ‘Mathis der Maler' and Symphonie in Es. 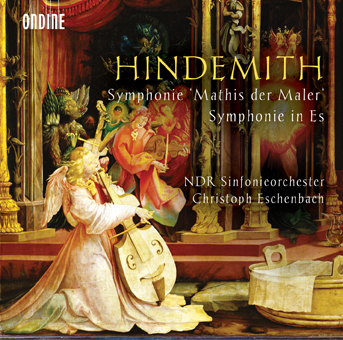 The orchestra's and Christoph Eschenbach's previous Hindemith release together with Midori won a Grammy Award in 2014. The ‘Mathis der Maler' Symphony is based on an opera that treats the life of the Renaissance painter Mathias Grünewald. Hindemith started to work on the symphony already prior to the completion of the opera. The symphony was premiered with great success by the Berlin Philharmonic Orchestra under Wilhelm Furtwängler on 12 March 1934. This performance was the last premiere of an orchestral work by Hindemith in Germany before the National Socialist regime issued a general performance prohibition applying to his works in 1936. Hindemith wrote his Symphonie in Es during his exile in the United States in 1940. The Symphony is absolute music in the tradition of the four-movement symphony of Beethoven and the romantic period. The work was premiered by Dimitri Mitropoulos who wrote to the composer: "The performance of your symphony was for me one of the highest artistic moments of my career."